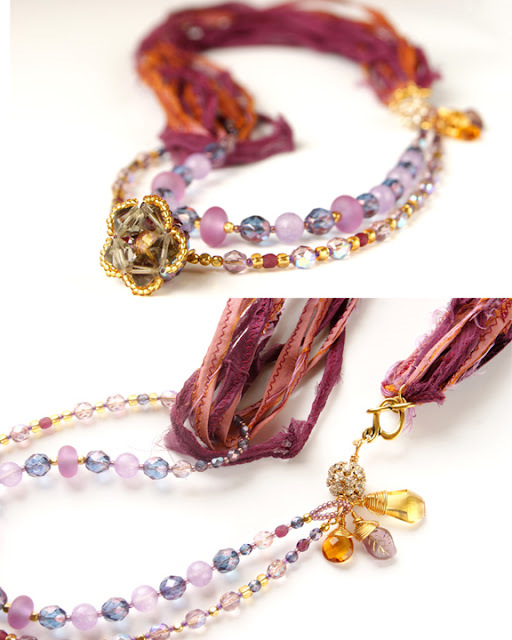 Inspired by a love of purple, the pieces in this collection are free-spirited and drenched in color and texture. Smooth glossy stones, rich silk and leather cording, and handcrafted focal pendants create pieces that will inspire and complement her wardrobe at the office and at play. 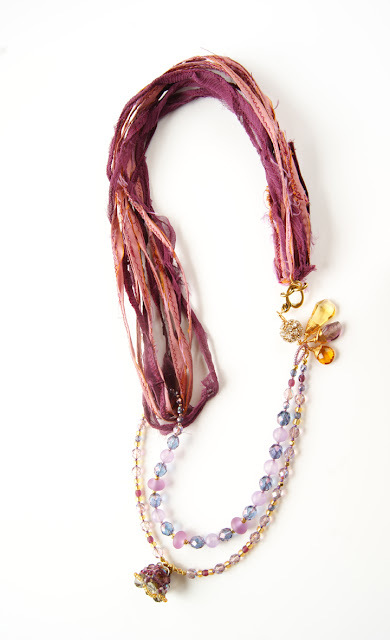 This gorgeous necklace features beautiful silk fibers in Violet and Plum. These have been sewn into loops, creating a very unique style of construction for this piece. 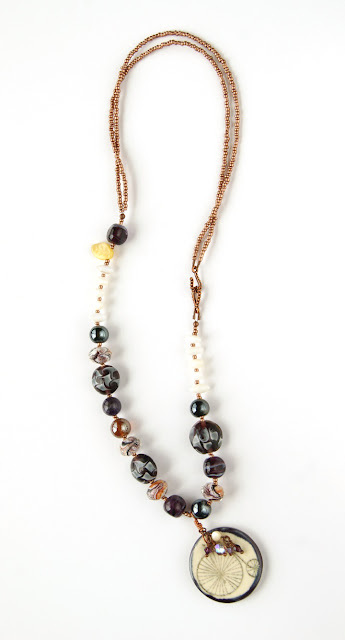 The Gold-Plated toggle clasp is placed whimsically on the side of the necklace and is combined with a sparkling gold and chaton sphere with beautiful Czech Glass briolettes, hand wrapped in Gold-Plated wire. A looped double-strand of shimmering glass beads in Amethyst, Lilac, Violet and Topaz features a stunning handmade focal by Janina Grigore Jewellery. This Matinee Length necklace measures 30 inches long, and hangs 15 1/2 inches from the back of the neck to the bottom of the focal flower. This pretty bracelet coordinates beautifully with the "Irreverent Flower" necklace, or is an elegant accessory on its own. 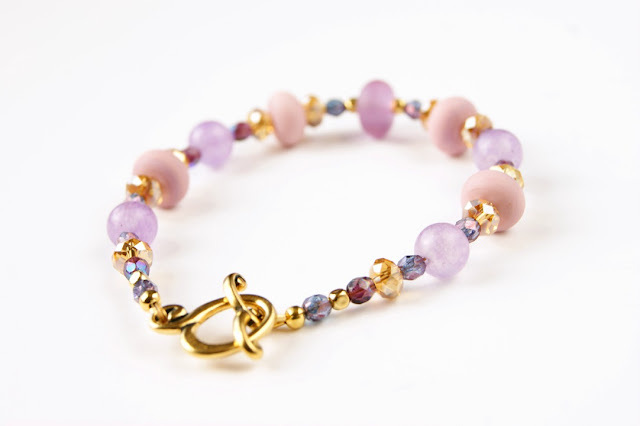 Matte Bohemian lampworked glass beads in Lilac and Lavender are complimented by pale purple glass rounds, shimmering Czech Fire-Polished faceted rounds, Topaz glass crystals, and Gold-Plated cornerless cubes. The piece is finished with Gold-Plated wire guards and crimp covers for durability, and has an elegant Gold-Plated toggle clasp. It measures 8 inches long. These earrings are elegant enough for evening, but will also look stunning during the day! 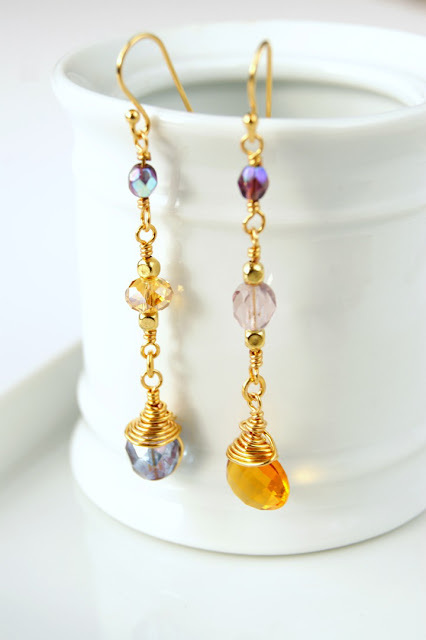 Czech Glass Topaz briolettes are hand wrapped in gold-plated wire, and accented with wrapped Amethyst Fire-Polished Czech rounds. The earrings have a 1 1/2 inch drop. 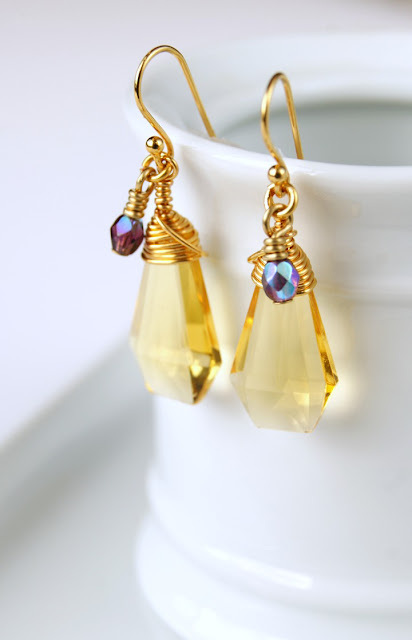 These luminous earrings boast hand-wrapped Gold-Plated links of shimmering Amethyst and Topaz. They are elegant and whimsical with their asymmetrical design. Fire-polished faceted Czech Glass rounds, glass crystal, Gold-Plated cornerless cubes, and a Czech Glass briolette have been used in this earring set. They have a 2 1/2 inch drop. 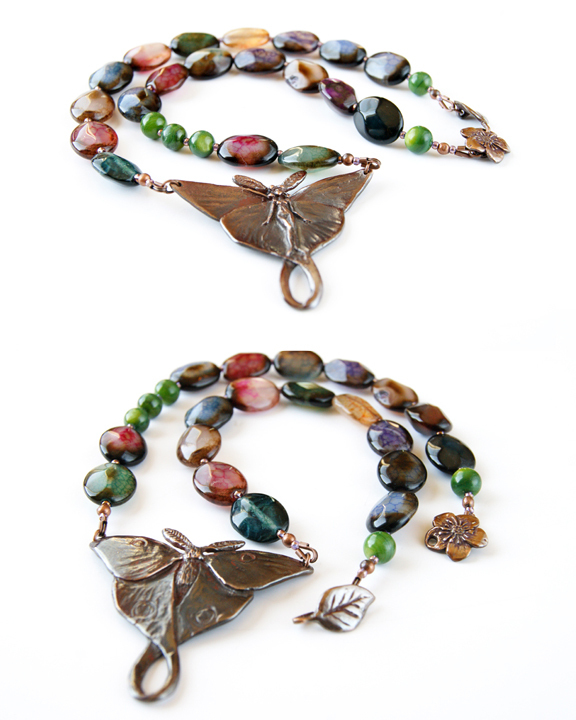 This necklaces showcases a beautiful handmade Shibuichi Luna Moth pendant by Cynthia Thornton. The necklace can be worn with the fairy hidden, by displaying the moth side of the pendant, or to reveal the whimsical fairy in all her loveliness. Complimenting the gorgeous pendant are colorfully translucent Rainbow Snakeskin Agate faceted oval beads, Green River Shell rounds, and shimmering golden Amethyst seed beads. Inspired by the vivid colors of Monet's paintings, and his love for his lush garden, this statement piece is rich with Grassy greens, Orchid purples and ornate metal components. The focal is a Lavender-Enameled vintage key. 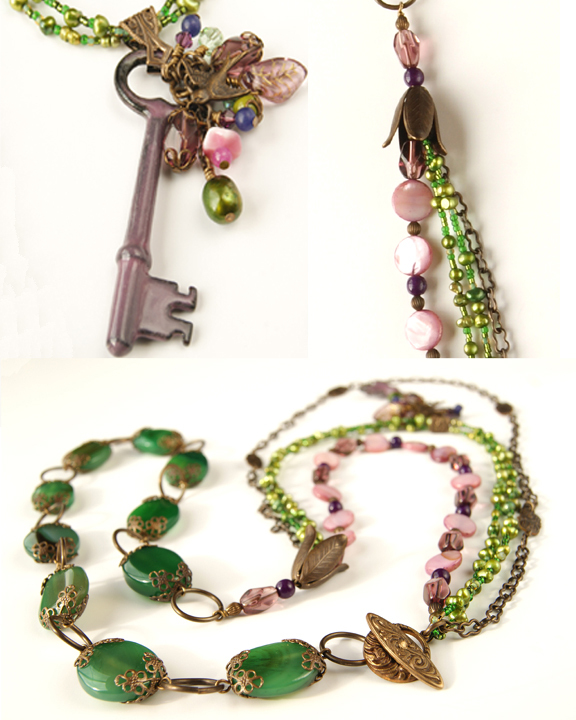 The key holds a wonderful assortment of hand-wrapped dangles in beautiful Purples, Pinks and Greens, and even a sweet little brass sparrow. Vintaj Brass components have been used exclusively on this necklace A Nouveau Toggle bar and ring form the clasp, and a beautiful Tulip bead cap compliments it on the opposite side of the piece. 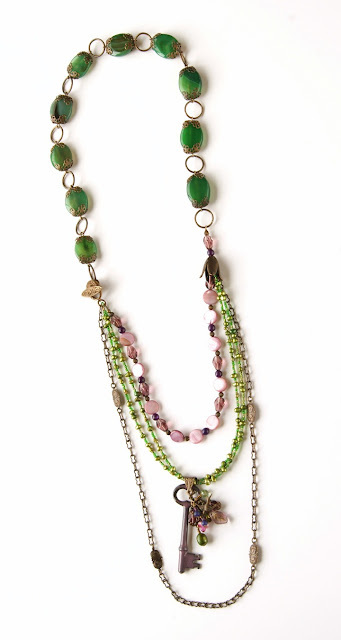 Strands of Orchid River Shell discs, Purple glass beads, shimmering Green Pearls, seed beads, and ornate Vintaj chain, hang elegantly at the front of this piece. This Opera Length necklace measures 42 inches long and hangs 21 inches from the back to the bottom center of the brass chain. This earring set was designed to coordinate with "Monet's Garden" Necklace, but will look gorgeous on their own. Vintaj Deco Windows are the focal of the design, with hand-wrapped dangles of purple, pink and green hanging below. Vintaj brass ear wires have been used, and the earrings have a drop of 2 1/4 inches. 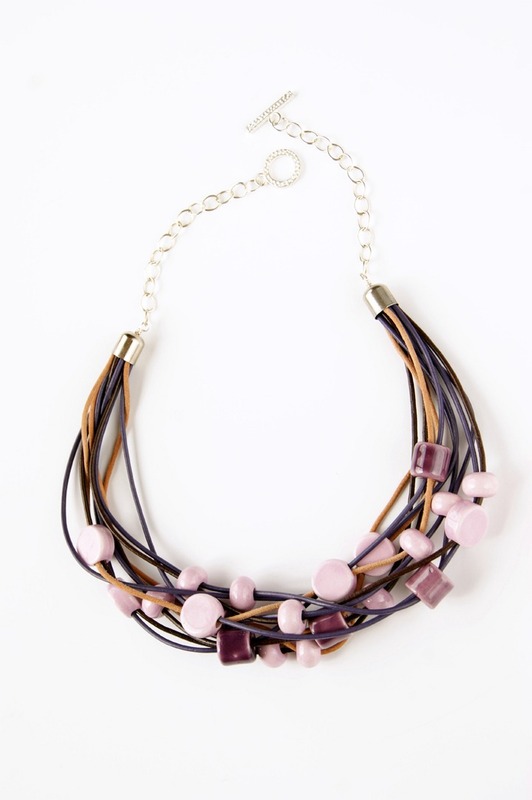 Strands of supple leather cord in Lavender, Chocolate and Nubuck intertwine to create this richly textured necklace that will be very fun to wear. 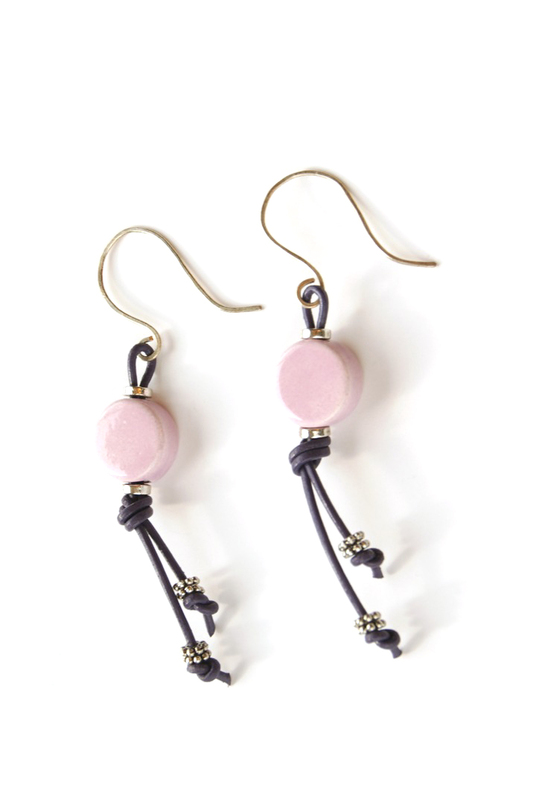 Large-holed ceramic beads in Lavender and Lilac connect the strands together and create a feeling of movement. The strands are bound by white steel bullet ends, and the necklace is finished with Silver-Plated chain, and a silver metal clasp. This Princess Length necklace measures 22 inches and hangs 11 1/2 inches from the clasp at the back to the front center of the necklace. 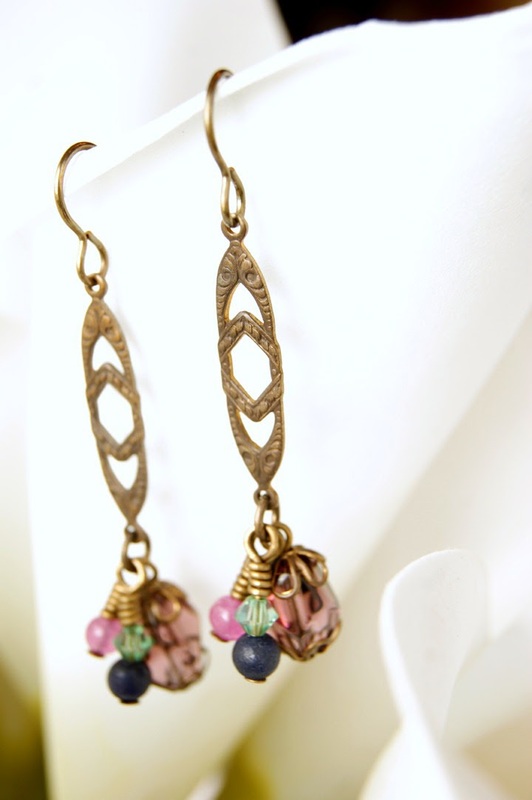 These fun and funky earrings can be worn with the "Wisteria Vines" necklace, or on their own. Lavender leather cord has been looped and knotted through each of the large-holed Lilac ceramic beads, and finished with Pewter spacers. Large handmade and hammered Sterling Silver ear wires complete the design. The earrings have a 3 1/2 inch drop. 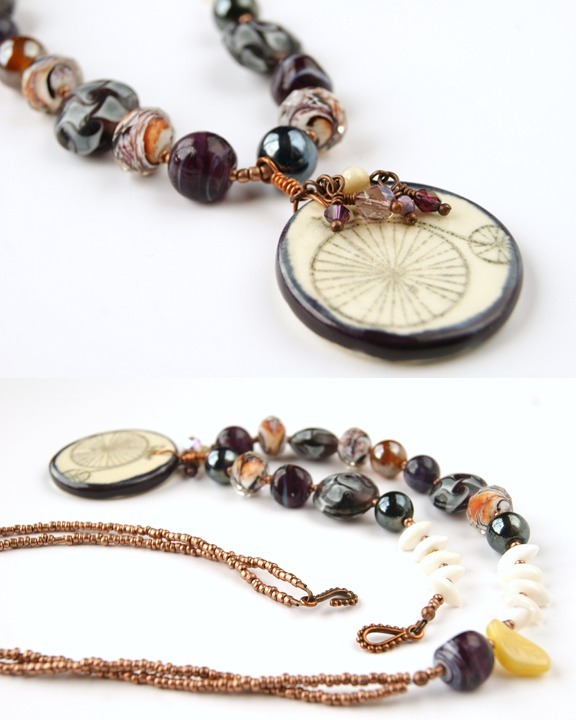 A vintage bicycle image is featured on the handmade ceramic focal by Amanda Barr for this delightful necklace. Hand wrapped dangles of Fire-polished Czech Glass and River Shell enhance the focal, adding shimmer and movement. The body of the necklace features a beautiful variety of glass beads in Purple, Black and Orange, and White River Shell Rice beads add variety and texture. One singular Yellow Czech Glass leaf adds a touch of whimsy to the design, which is finished with a double strand of Copper seed beads, and a Copper Hobnail Hook and Eye clasp. 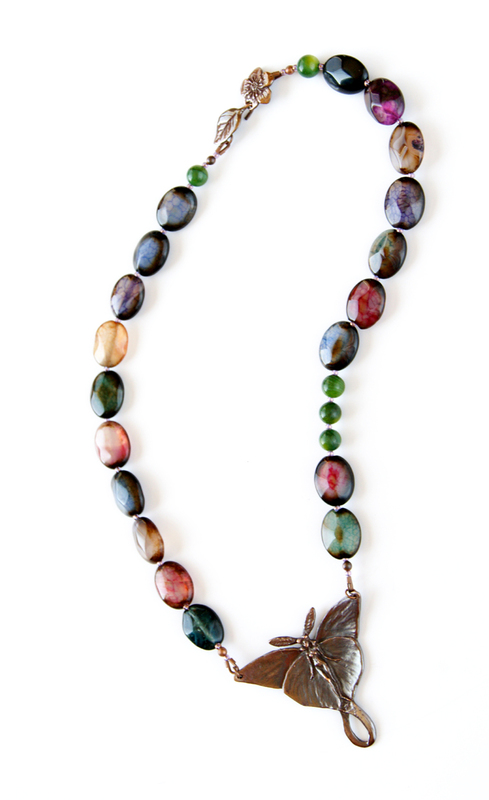 This Matinee Length necklace measures 23 1/2 inches long, and hangs 13 1/2 inches from the back to the bottom of the focal. Beautiful new designs, Erin! I love amethyst and the Monet inspired pieces are just lovely. Thank you so much for the compliments, Georgene and Geanina! I have loved creating this collection!